KIEV, Ukraine -- Ukraine's incumbent government led by President Viktor Yanukovych is likely to secure an outright win in the country's recently held local elections, according to results of an exit poll held there. Members of a local electoral commission empty a ballot box at a polling station in Boyarka, about 25 km (16 miles) south-west of Kiev November 1, 2010. Up for grabs in polls held on Sunday are Mayoral posts and seats in local assemblies. The ruling Party of Regions is apparently poised to get 36% of votes polled which would exceed the percentage of votes secured by others political outfits in the fray. On the otherside of the political spectrum, Yanukovich's former friend-turned-political opponent Yulia Tymoshenko was seen as mustering a mere 13% of votes with another opposition outfit led by former parliament speaker Arseniy Yatsenyuk slated to finish third with just 7% of the vote. Our Ukraine party led by ex-President Viktor Yushchenko garnered only 2.3% while Ukraine's Communist Party finished with a slightly higher vote share of 5.9%. The polls are being monitored by some 2400 independent observers including around 500 international observers. Back in 2005 when Ukraine last went to the polls, held in the wake of the Orange Revolution which unseated Yanukovych, it was Yushchenko who romped to power along with Tymoshenko who was then his political ally. However, the Yushchenko Presidency of 2005-2010 was a chaotic one despite the former Soviet Republic enjoying unprecedented respect for human rights. Despite this, Yushchenko suffered a humiliating defeat in Presidential poll held in January which also saw the pro-Moscow Yanukovych make a triumphant return to office. The run-up to the elections witnessed a bitter campaign with political differences often getting overshadowed by personal ones. 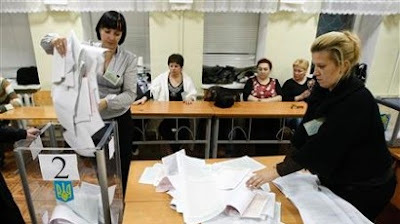 In an apparent bid to draw political mileage, the Tymoshenko camp accused the ruling party of resorting to widespread rigging of votes while the government alleged "provocation." Meanwhile, US Vice-President Joe Biden stressed the "importance of free and fair elections on October 31 and media freedom" in a recent phone call with Yanukovych. Conducted by GFK-Ukraine, the survey polled 43,800 people.